Of all the baseball monikers used to describe impressive achievements, the Immaculate Inning is my favorite. An Immaculate Inning requires a pitcher to record three straight strikeouts in a half inning throwing only 9 pitches. The feat has been accomplished a total of 45 times in major league baseball; the first in 1889 by John Clarkson of the Boston Beaneaters against the Philadelphia Phillies (who were then called the Quakers). Since then, opposing pitchers have registered 4 Immaculate Innings against the Phillies: Joe Oeschger, Boston Braves- 1921; Milt Pappas, Chicago Cubs- 1971; Pete Harnisch, Houston Astros- 1991; and Byung-Hyun Kim, Arizona Diamondbacks- 2002. The total of 5 against is the most of any team in baseball. Only one Phillies pitcher has ever recorded such an inning, and he did so on this day in 1991. Home against the Reds, the Phillies threw Andy Ashby, who was making just his second major league start. After getting behind 3-0 in the first three innings, Ashby entered the 4th and was, well, immaculate. He threw the same sequence of pitches to three Reds batters and recorded three swinging Ks. Hal Morris, Todd Benzinger and Jeff Reed each went down on curve-ball, fast-ball, curve-ball. 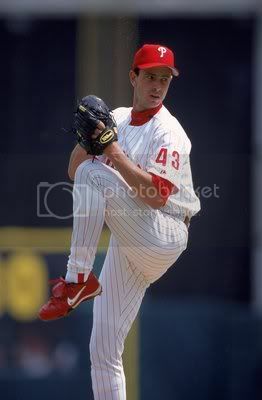 We’ve had Steve Carlton, Grover Cleveland, Jim Bunning, Robin Roberts, Curt Simmons, Curt Schilling, Cole Hamels, Cliff Lee, and Roy Halladay, but the only Phillies pitcher in the team’s almost 130 year history to throw an Immaculate Inning is Andy Ashby. That’s quite an accomplishment Andy, or whatever. UPDATE: Phillies reliever Juan Perez only pitched 5 innings this past season, but incredibly one of them was an immaculate inning, 3 weeks after Lalli posted this. He became the 2nd Phillie to throw an immaculate inning on July 8th, 2011, when he struck out 3 Braves on 9 pitches in the 10th inning of a 3-2 Phillies win. hi – love the site, but you need to update this page. juan perez threw the phillies’ second immaculate inning a few weeks ago (vs braves, early july series). keep up the good work! Hey um “Marian” um that’s my dad and he was still the first making him better!! Keep going dad!!! 🙂 love you!!!! # 1 in my heart and the best baseball player to play the game in my eyes! 🙂 thanks for everything!! Love you!!! I remember that game and realizing it was immaculate when it happened. I’m not sure many others realized it at the time. Amazing.